On August 13, 1961 the Berlin Wall went up to separate East Berlin from West Berlin during Russian occupation of Germany after the WWII. We all know the stories of families torn apart because of the wall and how their country got out of sync with itself because of this separation. 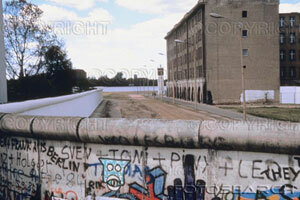 I was in New Orleans last week and the levy, to me, was much like the Berlin Wall. Although the goal of the levy was to separate the unforgiving muddy Mississippi from the lives and homes of New Orleans, after Katrina is represented the harsh reality of class disconnection. And now, even though the levy us up, the “wall” is even higher and thicker than it was before Katrina. There is no longer a middle class in New Orleans and the economic and racial inequalities are more profound than ever. For example, if you happen to be on the fringe of poverty before Katrina, you were definitely drowning in it afterwards. Katrina was not a war, it was a natural disaster. 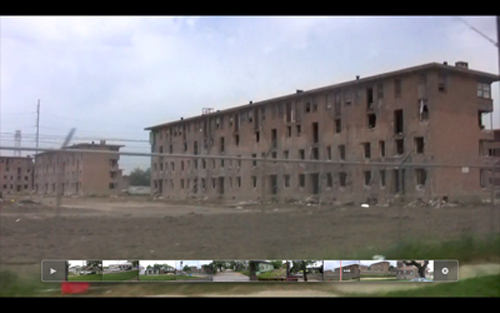 And it was not just the Lower 9th Ward that got hit. There are dozens of neighborhoods that were destroyed. I visited two of them while I was there, and I was heartbroken and shocked by what I saw. This did not happen a few weeks ago. This happened 2.5 years ago! The Berlin Wall is gone, just small fragments still stand near Checkpoint Charlie, but as for the levy….. only time will tell. If you want to support a group that is doing great work in New Orleans by training at-risk youth to work in restaurants, please visit CafÃ© Reconcile. The work they are still doing is amazing! Please, go to New Orleans, it is a fabulously rich American city with roots deep in the African, Caribbean and French culture. Tourism is one of the best ways to get the city back on its feet. But whatever you do, don’t stay at the St. Louis Hotel in the French Quarter. I tried to stay there for a few nights, but the room was so smelly and the staff so unpleasant that I left and went to the Ritz Carlton on Canal Street. Lillette in the Garden District — they have a beet salad to die for! It’s me Susan, the women at the Colony Club at the front desk. I had no idea what you did for work. I am blown away by the footage and moved by your words on this New Orleans coverage. Thank you for sharing it a side of you that I am glad I saw a bit of. My friend Nidia and I will be going out again soon to listen to music, please let us know if you would like to come with us. We would love to get to know you better.